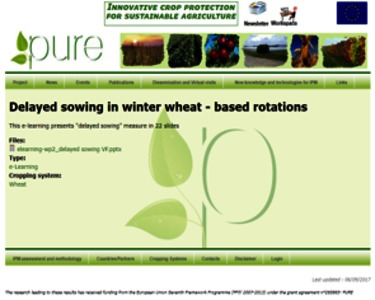 The purpose of this tool is to advise farmers and crop advisors on modifications that can be made to sowing time in winter wheat based cropping systems that reduce weed, disease and pest pressures. This is for systems where there are reduced use of pesticides. The tool is a presentation that covers a number of strategies including sowing date and variety choice that will improve the performance of the crop. The tool is not specific for organic farming. 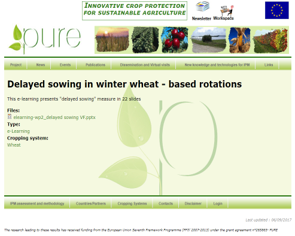 Reduction of pesticide and fungicide use in winter-wheat production can increase challenges in disease, weed and insect management. The research leading to these results has received funding from the European Union Seventh Framework Programme (FP7/ 2007-2013) under the grant agreement n°265865 (PURE project).